Bit of a strange one today - the bunkering was not completed yesterday evening so we have been repeating the exercise today. 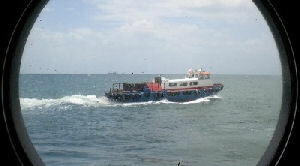 We've also had a rendezvous with a small boat delivering a set of spare fuses for the winch. Heading out to sea requires very careful planning and preparation - once we are offshore, if we don't have something we need with us, we can't just order it over the phone for delivery. A visit to the chemistry lab has revealed what the geochemists - Doug, Carla and Alex - are up to at the start of the expedition. When the seafloor mapping gets underway in the Cayman Trough, the chemists will start to 'sniff' out the deep-sea vents. 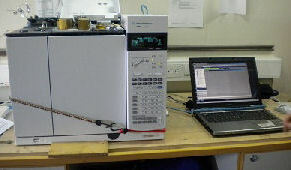 They will examine the composition of seawater at various depths using a variety of sensors. 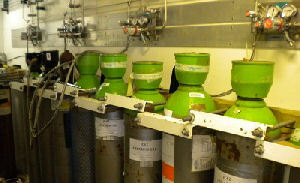 And they'll also collect samples of that water to analyse in more detail on board the ship and back in the UK. The ship's chemistry lab looks like any other science lab in schools, colleges or universities with one big difference: everything is bolted down! 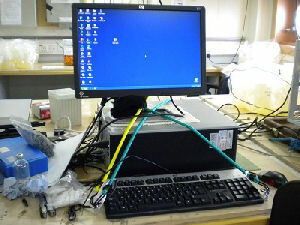 The team has brought cylinders of helium, nitrogen and hydrogen with them, plus a complete Gas Chromatography (GC) system for analysing water samples, and a variety of laptop computers. All of this was either loaded on the ship in September 2009, when the RRS James Cook was in Falmouth, or was shipped out from Southampton in February 2010. Whichever way you look at it, it has been a major logistical exercise to make sure we have all the equipment we need aboard.